Best Trampoline Springs: What makes the trampoline so bouncy? springs right. But what when these springs start deteriorating? An impair trampoline springs means a less bouncy trampoline. No one would want to jump on a trampoline that cannot lift them higher in the air because this is when we enjoy the most. However, none can stop the gradual wear of the spring with incessant use over time. Even when you buy the best trampoline from a well-known brand, it is very likely of the trampoline springs to lose elasticity and bounce in the course of time. The springs may break or may become fragile due to corrosion. Whatever the reason for an impair spring may be, replacing it with the brand new spring is the only solution to bring back the original bounce and fun in your trampoline jumping. When springs break or deteriorate, they can also cause the wear and tear of the trampoline mat. Complications don’t end here. Broken or damaged springs can also pose the threat of potential injury like bruised skin or a deep wound at worst. Thus, if your trampoline has grown older and its springs have lost the battle against time, it is sensible to replace them as soon as possible. There are various manufacturers out there who deal in the best trampoline springs. We have picked some of the most trusted brands and their trampoline springs for replacement. You can go through these trampoline spring reviews to find out all the necessary specifications for finding a product that suits you most. If your trampoline has worn out, they can cause the sagging of your trampoline mat too. This will take away all the fun and bounce off your backyard. Thus, SkyBound has two amazing trampoline springs options to consider according to your prerequisite. It offers Gold Premium or Silver Standard trampoline springs. You can choose either of the set depending on your preference. The Gold Premium springs are more durable and hard-wearing because of the yellow Zinc plating featured on them. It prevents oxidation i.e. premature rusting and hence makes sure long-lasting trampoline spring for your equipment. However, both the springs are designed and fabricated from the top quality steel and feature the thickest steel gauge. They have the highest number of coils for enhanced safety and great bounce. Depending on the size and quality chosen, each set will come either as a set of 10 or 15 springs. Before you order the set of springs for yourself, measure your old springs from hook end to hook end for getting an accurate size. Is your trampoline missing the original bounce? Bring it back with this solid trampoline spring set from Upper Bounce. 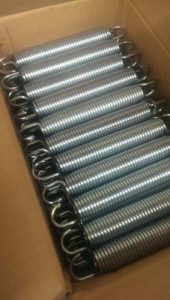 Replace your damaged and deformed springs with these heavy-duty galvanized springs that are sturdily built to enhance the bounce of your trampoline. Measure the entire length of your original springs from one of its hook end to the other to make sure that you buy the picture-perfect springs for your trampoline. These springs are also resistant to cracks and cold-weather so that they can endure the seasonal changes without any trouble. To make the deal even more enticing, the manufacturer is giving a one year warranty on the product. These robust trampolines will make sure that your kids jump on it safely and enjoy all the fun and high bounce. The price at which these springs come is also very reasonable and would not cost you much. Trampoline Pro is a well-known manufacturer of high-quality trampolines and their durable replacement accessories. These premium and heavy-duty trampoline springs will bring the same bounce for your trampoline with which it originally came. They are specifically designed to provide safe and secure jumping. They are also made durable so as to bear heavy weights for a relatively longer time. The coils are thick and feature an increased number of turns for providing great bounce. They will fit the length of your trampoline perfectly. They are very affordable and come at a cheap price. You can choose size and quantity according to your requirement and after checking the number of stretched out and worn out springs of your trampoline. Changing the damaged springs on time will make sure that your trampoline remains strong and sturdy for several years to come. Before you replace your trampoline mat for insufficient bounce, inspect all your springs. Impair and stretched out of shape springs are the most common reason for lost fun and reduced jump. These high-tensile springs are heavy-duty and constructed from properly galvanized steel. When you assemble these replacement springs into your trampoline, you will experience a renewed jumping experience. The springs are extremely durable and effectively resistant to cracks and cold weather. 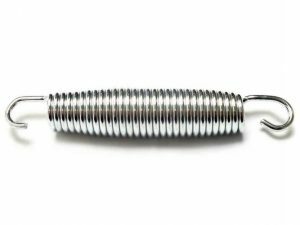 These high-quality springs are completely identical to your original springs and provide the same bounce as them. 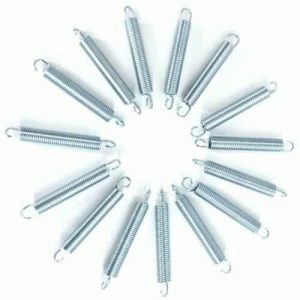 They are affordable and you will not be spending hundreds of dollars for buying these topnotch replacement trampoline springs. The galvanized steel is the main reason for enhanced durability and sturdiness of this replacement spring set. Once you purchase this set, you can rest assure of efficient springs for many years to come. To bring your old trampoline bouncing days back, replacing your old and weary springs is the only solution. These amazing replacement springs from Koval are built from extremely high quality steel. The number of coils is kept the highest with the thickest steel gauge so that you receive the maximum safety and outstanding bounce. This replacement spring set contains 20 springs of size 7-inch which is measured from hook end to end. They will fit your trampoline flawlessly just like the original springs. The high-quality steel used in the construction of these springs has ensured resilience and durability. You should properly measure your original springs before you purchase the spring for your trampolines. Even though this spring set is not very cheap, the quality construction and galvanized steel have made the product worth buying. So, if your trampoline has become few years old, inspect all the springs of your trampoline. 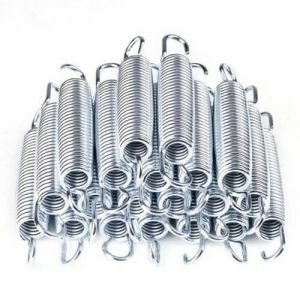 If there are damaged and unsafe springs, buy new best trampoline springs instantly and change the old one. When trampoline springs are changed at proper intervals, it will also make certain that the life of your equipment is increased effectively. SkyBound Trampoline Springs are designed to replace your trampoline’s worn out, rusted, dangerous springs and return bounce to your old sagging mat. 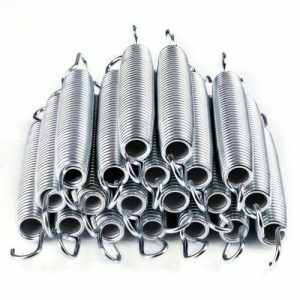 IMPORTANT: Prior to purchasing, measure your original springs from hook end to hook end, disconnected from your trampoline, and completely unstretched. For help, please contact SkyBound. Each spring is designed to exceed your original manufacturer specifications, offering the best quality steel, the thickest steel guage, and the most coils to provide the safest, strongest, and bounciest springs.